Yesterday afternoon the weather took a bit of a turn from the consistent sunny, weather of the past few weeks. 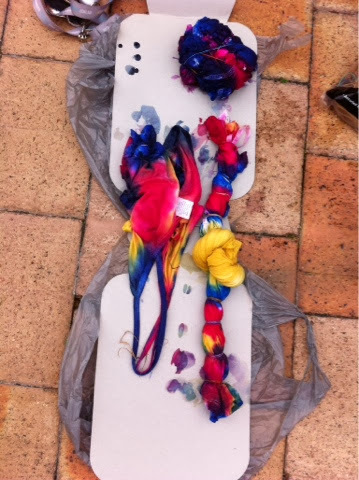 We decided that we should do something fun and creative to entertain ourselves - tie dye! 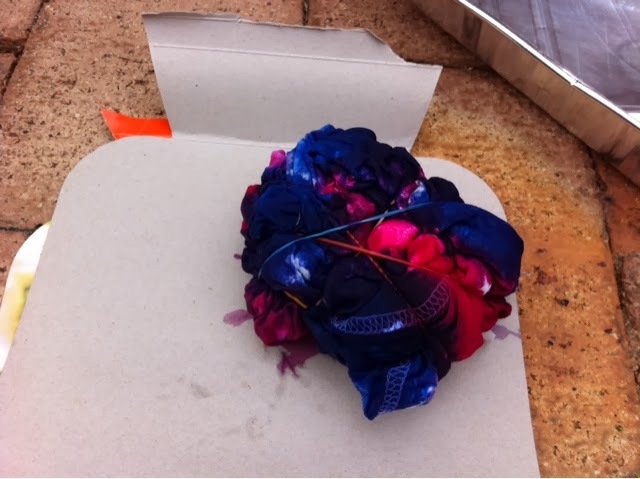 Nikki is the tie dying guru of the group and, after purchasing the necessary equipment for the task, she talked us through it. It depends how many colours you want and the dye stretches a very long way; we used four packets of dye (yellow, green, pink and blue), salt, four empty plastics bottles, boiling water, three tshirts each (12 in total - the dye would have done many more but we only used half a packet of each), a bag of elastic bands, trays to put the dyed tshirts in while trying. 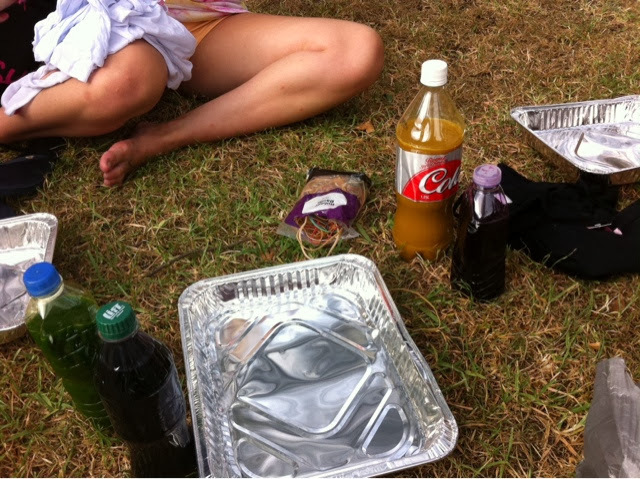 The dye will stain fingers/colours/surfaces so either put a cloth/sheet/newspaper down or do it outside on the grass like we did. Open your elastic bands out and set down your tins ready. There are several kinds of designs you can do (check them out on the internet for detailed descriptions). I attempted a spiral; I say attempted as I had no idea what I was doing properly. You need to put your finger in the centre of the shirt and keep pulling the material around, you guessed it, in a spiral. 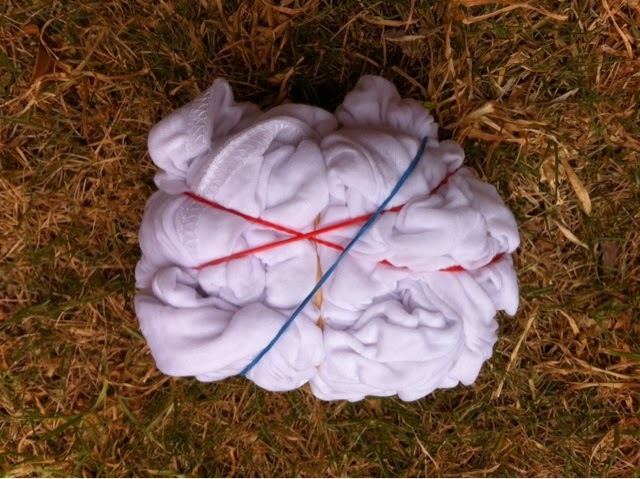 Tie the fabric with several elastic bands and carefully pour the dye on where you fancy! I did a colour in every section between the elastic bands. After doing so I carefully moved it on some cardboard to start drying (resulting in blue fingers) NOTE: gloves if you don't want alien hands! The cropped vest (bottom left) was done by taking several grasps of material and tying with elastic bands. We left them for 3 hours (overnight is better but we were impatient), then rinsed them out with cold water. 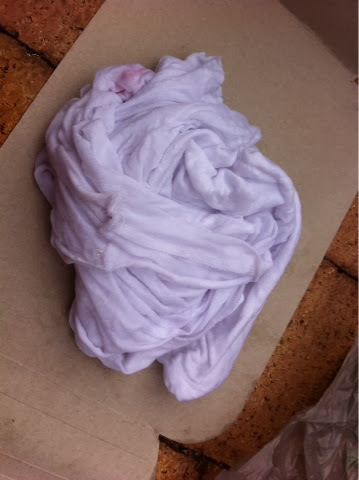 If there are white patches on the fabric, the dye is likely to run into those patches but it will fade over time. 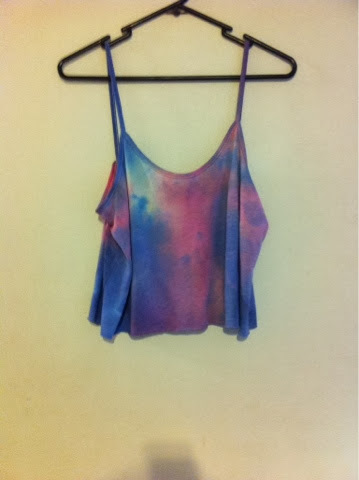 Leave to dry or put on a spin in the washing machine. 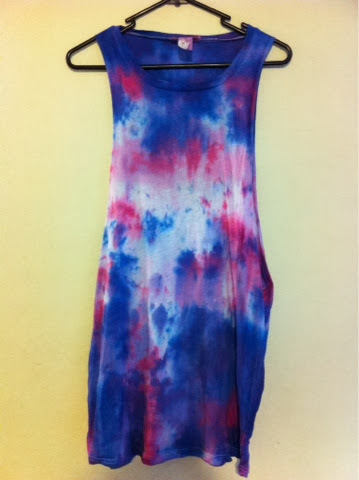 The dye will definitely run the first few times they are washed but Nikki assures me they do stop running after a while. Here are the end results.. Very happy with the patterns I achieved but, an obvious secret, they are all completely random. 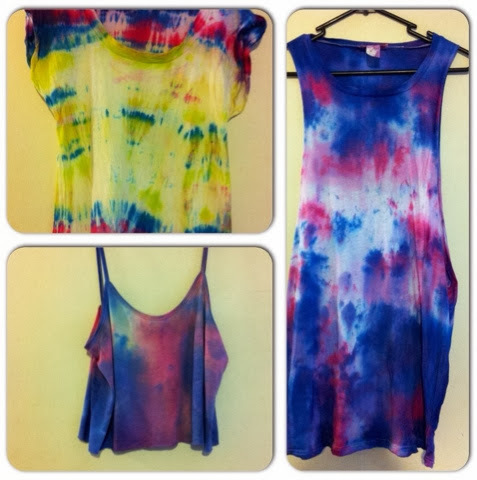 You can't really go wrong with tie dye it seems, so have a go for an inexpensive afternoon of entertainment! 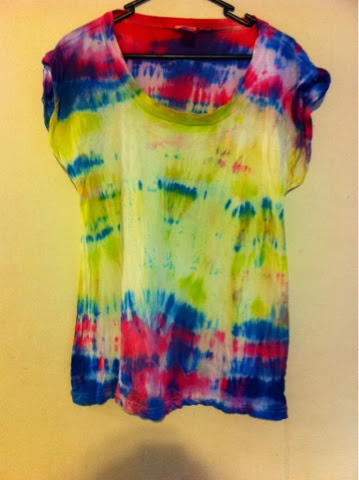 Wah, I love tie-dye, haven't done it for years!